At risk of sounding like a weekending townie, I love the Limpley Stoke Valley. I even love the name. My best girl, A, was born in Trowbridge and brought up in Bath and the surrounding area. Consequently I have native-by-proxy rights. Whenever A gets what she calls ‘roots problems’ we hie off to Bath or Avoncliff to stay with friends fortunate enough to live there. There is something very close to perfection about walking before breakfast in receding mist on a frosty morning. The mud has the smallest suggestion of a frost crust, so that there is a faint crunch and rustle as we walk through the well trampled kissing gates alongside the river, and there is a rime like salt on the broad roots of the trees. You can taste the air, and feel exactly how your lungs work with each breath. Add in woodland with a haze of new growth all ready to burst into leaf, but waiting still, the first catkins, and the rich yellow of new branches on the willows, by a river which has only reduced marginally from full spate; add in bird song, and the shanty town of all-year-round narrow boats on the sedate curve of the canal aqueduct, high above the river like a nineteenth century version of a flyover; add in almond croissant still warm from the oven in the community shop in Freshford… all right, I do sound like a weekending townie. Almost spring, almost breakfast; perfect morning. 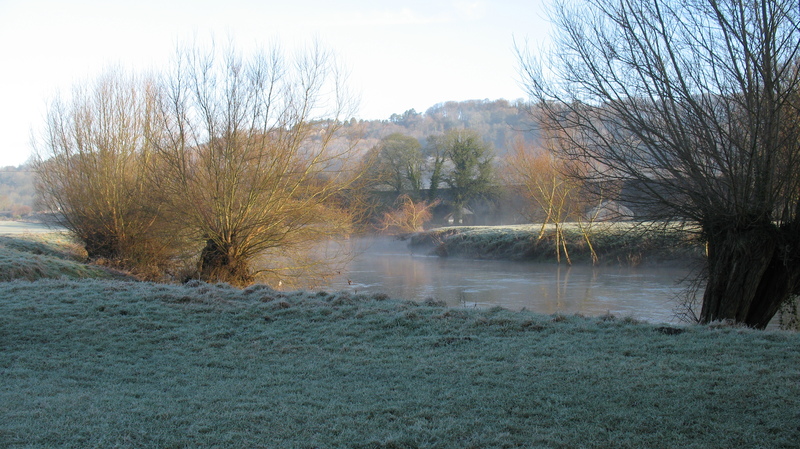 This entry was posted in Inspirations and tagged Avoncliff, Bath, Cherry Potts, Freshford, friends, Limpley Stoke, travel writing, walking by Cherry Potts. Bookmark the permalink.